I'm redeveloped my food pyramid to reflect the ground-breaking knowledge I've acquired this past year. 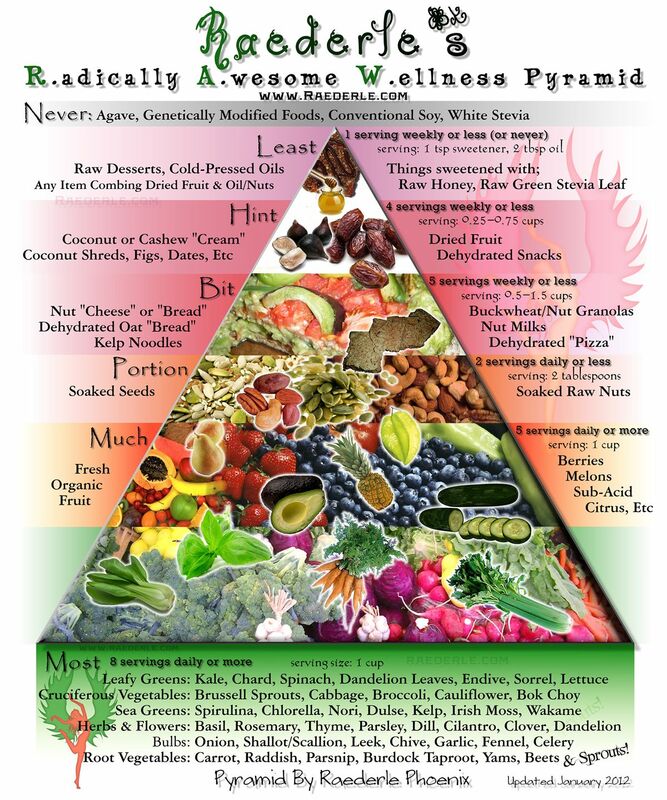 You can click here to see my "old" food pyramid. There are a few issues with its design which I've addressed in the new design shown above. In my old food pyramid I used just "cups" to illustrate quantity. As I explain in detail in my book Vitamin Confusion Solution, measuring foods by volume leads to error. When I say "eight cups of vegetables" do I mean eight cups of lettuce or eight cups of kale? The difference in calories and nutrition is tremendous. In my new food pyramid design, I measure food types by calorie, not volume. Calories and volume are very different measuring tools. And "serving" is a vague term that has virtually no meaning. What Can Calories Tell Us About Food? Calories are not what determine your level of well being or your weight. Calories do illustrate the density of a given food. Lettuce is very watery, and very soothing to the body. Lettuce has a similar make-up to the body, being mostly water. It is easy to digest and assimilate. This is partly illustrated by lettuce containing only five calories in one cup. Usually, when I eat lettuce, I eat the entire head (which is 100 calories). An entire head of lettuce may be enjoyed in a bowl with sauerkraut, spinach, chunks of apple, nori, a handful of walnut pieces, etc. A head of lettuce makes for a very reasonable meal base. Consider medjool dates. It only takes one and a half medjool dates to consume 100 calories. This doesn't make dates bad. It just means that consuming four to seven cups of dates would over-load most anyone's body and not provide the nutrition needed in the process. Nuts, seeds, grains and legumes have little water content. They are densely packed. These foods contain globular proteins as opposed to amino acids. You can learn about that in my article about protein. A few nuts will contain more calories than an entire head of lettuce, and this illustrates the effort the body needs to go through to extract the nutrition and energy from the nuts. The more densely packed something is, the more digestive effort required to extract the nutrition. You do not need to consume nuts or seeds for their protein content. Because of how exhausting it is to digest nuts and seeds, some raw vegan athletes and health gurus do not eat them, or eat them very rarely. In 2010 I consumed around a cup of nuts and seeds daily. This was a mistake for me. In the past year I've consumed one to five tablespoons of seeds in a day, sometimes none, and a handful of nuts in a month. I consume Brazil nuts mostly, for their selenium content, and chia seeds for their excellent balance of fatty acids and minerals. Despite everything I just said: Soaked and rinsed nuts, seeds and grains can be an excellent tool for transitioning to the raw diet. Americans (and many people all around the world today) are raised on a diet high in densely packed foods. These high-protein, refined and processed foods are filling but lacking in nutrition. Nuts, seeds and grains are an improvement from processed foods, especially when soaked and rinsed before consumption. Instead of going for a bowl of granola, you can instead make a bowl of berries with hemp seeds, chia seeds, crushed walnuts and almonds, and pour home-made nut milk or seed milk over the top. For added sweetness, minced figs, dates or raisins may be added. This sort of meal is satisfying, even for someone who grew up with peanut-butter-jelly sandwiches and steak and potato dinners. In my new food pyramid I've separately ingredients from meal types. 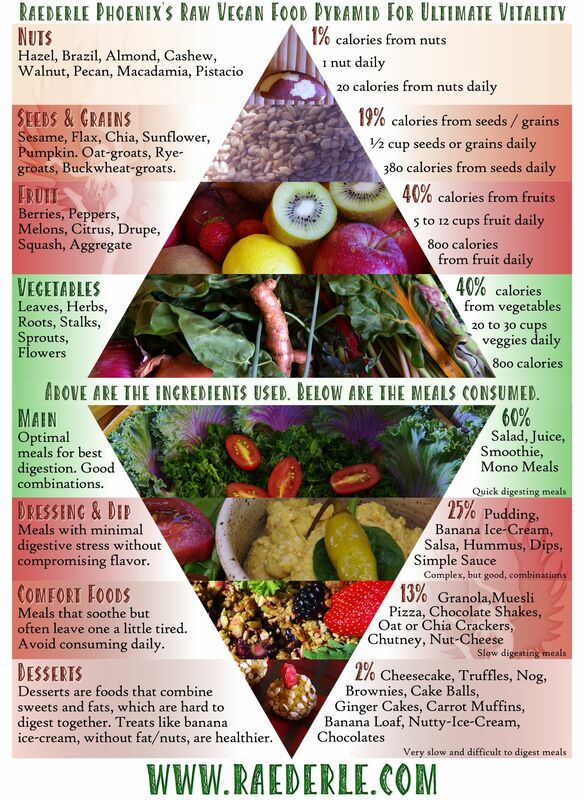 The "upside-down" pyramid in my new food pyramid shows meal types and how often to consume them. The above "granola" example would fall in to the "13%"/"Comfort Foods" zone. To balance the ingredients used one can refer to the upper pyramid and use today's and tomorrow's nut and crush two nuts, add a quarter cup of soaked oats and quarter cup of mixed seeds (all of today's seeds), and use three cups of berries from the fruit aspect of the day. The density of calories in meat, dairy, eggs, processed foods, etc, is similar to the density of calories in nuts, grains and seeds. However, nuts and seeds contain healthy fats (instead of processed chemically altered fats), and nuts and seeds contain volumes more nutrition than meat, dairy, eggs, wheat, most beans, and so on. Therefore, they are an ideal substitute when making a transition to a healthier diet. To understand all of this better, look at my food type comparison chart. 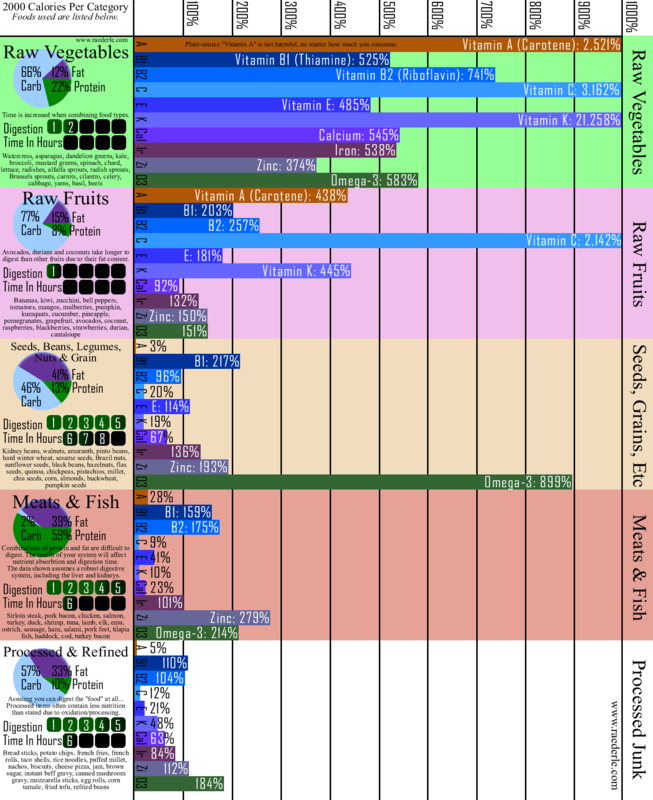 This chart illustrates what nutrition you'd get from the following food groups if you consumed 2000 calories of food in the category. Find "100%" at the top and follow the vertical line down to the bottom of the chart. That is the minimum of each nutrient that you should consume daily. Notice that 2000 calories of any single food group will not provide enough nutrition except vegetables. Not even fruits! In the old food pyramid I put that "any item combining dried fruit with nuts and/or oils should be limited to once a week or less." In the new food pyramid I put desserts on the tip of the meal type pyramid. Our tastes are wired to absolutely adore the blend of sweets and fats. Traditional ice cream is made up of dairy (fats and protein), and sugar/fruit (sweets). Cake is made up of bread (starch, protein and fat), dairy (fat and protein), eggs (fat and protein), sugar (sweet), sometimes fruit (sweet), and sometimes nuts (fat and protein). Raisin bread is made up of bread (starch, protein and fat), raisins (sweet), and sugar (sweet). Look at the packages of various food items in the grocery store and you'll see over and over again that there is a combination of fats, sweets, and salt. Often canola oil and msg make their appearance, even on organic items, such as organic vegan hummus. What a great reason to make your own hummus! The problem with consuming fats in combination with sweets is that it is hard to digest. In processed foods, fats and sweets often chemically refined/altered, making them dangerous of their own accord even when not combined. If you're suffering from irritable bowel syndrome (IBS), candida, stomach ulcers, acid reflux, frequent stomach pains, painful bowel movements, bloody stool or nausea, then you absolutely have digestive problem. Digestive problems are not automatically cured by going on to a raw vegan diet. It takes careful awareness of food combinations and food digestion times to heal the stomach. I know this from personal experience, because I had all of the conditions I just named in the previous paragraph, and only some of them went away by transitioning to the raw vegan diet alone. It took careful refinement of my diet to cure all of those issues. Please help spread the word by pinning this image! Note: Sometimes brown sugar is not a less refined version of white sugar. Sometimes it is white sugar with molasses added for color. 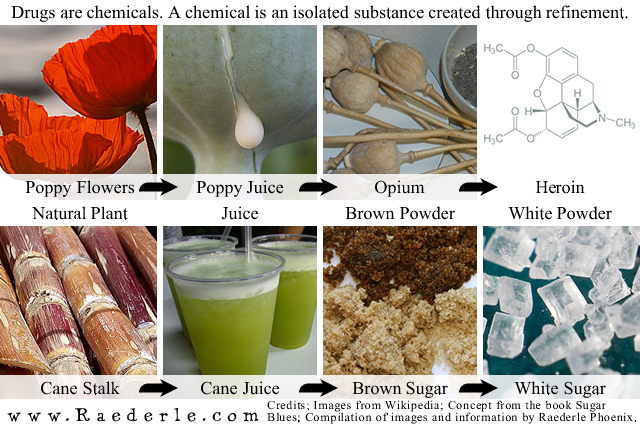 Either way, I do not recommend consuming cane juice, brown sugar or white sugar, ever. In a previous pyramid (in 2010), I listed agave at the tip of the pyramid. After doing further research, I moved it to the "never" section of the pyramid. Agave is not generally raw, even though it is advertised as raw. Agave is made from the refinement of the agave root, not the agave sap, and is not the same creation that the ancient people made. Agave is not low glycemic, even though it says it is on many bottles. You can look this up; it's officially not low glycemic, and beyond that, it's shown to have harmful effects on diabetic humans. Beyond all of that, agave ranges from 70% to 90% fructose. In most cases, that is actually worse than high fructose corn syrup. What's so bad about fructose? Fructose does not fuel the brain, like glucose does. Fructose does not trigger satiation in the body; fructose makes you want to eat more. Non-hybridized fruits contain 50% glucose and 50% fructose, roughly speaking. This balance gives them a sweet taste (from the fructose), fuels the brain (from glucose) and gives you a full feeling (from glucose). The fiber, minerals and water content of fruits serve as an additional buffer from the glucose and fructose. That buffer is important for the health of your gums, teeth, stomach, brain, and so forth. Agave is something my husband and I never eat, in any portion. It gives me muscle cramps, and it gives my husband stomach pains and a headache, and many other unpleasant things. When it comes to stevia, I've separated stevia into two categories: white stevia and green stevia. Green stevia is just the powdered leaf. It ought not be bad for you, in theory. White stevia, however, is refined, not just powered. In fact, sometimes as much as half of the volume is not stevia at all, but an artificial sweetener of some sort. Yikes! In terms of honey: Raw honey is not considered vegan by many people. It does utilize a living creature: bees. Bees also have the right to humane treatment. Raw honey, preferably consumed with the comb itself, is full of trace minerals, and it is the only sweetener that naturally has nutritional value of its own accord. My recommendation is to use dried fruits, fresh fruits and frozen fruits to sweeten your desserts. Whole foods, that retain their original mineral balance from nature, are always best. Oils are not a whole food. While the fat may not be a concern to you, the fact that oil is not a whole food should be of concern. Some cold-pressed oil on occasion will not harm you, but eaten daily it can be detrimental. Oils are not ideal for detoxification. I've gone through periods without any oil at all for months, as well as periods where I consumed it daily. I definitely felt better without any at all than I did consuming oil daily. That said, there is a benefit to oil. Unlike nuts, seeds, grains, beans, meats, cheese, etc, anything you can name that has fat in it: Oil does not have protein. This is a wonderful thing about oil. Because it is 100% fat it is much, much easier to digest than a nut or seed which is high fat, high protein, some starch, some carbohydrate, and so on. All that complexity requires a lot of different digestive enzymes which neutralize each other. It is a chemical conundrum in the stomach when you consume meals with that much complexity. Oils don't pose that conundrum as long as you don't combine them with something high protein or sweet. If you use oil on vegetables, but do not add any fruits, nuts or seeds, then you now have the loosely packed amino acids to become proteins in your body, you have the fat you need to fuel your brain and liver from the oil and also in part from the vegetables, and you have all the minerals and vitamins from the vegetables, and the nice oily-fatty flavor from the oil. However, if you simply add oil to a meal already loaded with nuts, seeds, fruits, vegetables and so on, you're just adding more complexity and difficulty for your stomach. The less fat and protein sources in a meal, the better for your stomach. Some desserts, such as a coconut cream pie or a raw vegan cheesecake require cold-pressed coconut oil to get the right effect. Cheesecake, however, isn't something we need to eat daily to have a wonderful life. One last facet of oil consumption is that most oil consumed has gone rancid. For a really raw non-rancid oil, look for ice-pressed as opposed to cold-pressed. Dehydrated items are not whole; they are missing the water content that nature gave them. Being dehydrated makes food harder to digest, exhausting and dehydrating your body. Dehydrated food should always be consumed after drinking ample water. Ideally, drink a tall glass of water (or two) twenty minutes before eating dehydrated food. Then sip another glass of water with the dehydrated food. Generally, do not consume water during a meal, only twenty minutes or more before a meal. Water dilutes the stomach, slowing down the chemical reactions we call digestion. This "slowing down" can slow your entire day down by making you tired, especially if you have weak stomach acid. A gulp of water after a meal should be included to swish in one's mouth. This cleans the teeth and prevents dental issues. When it comes to foods like raw pizza and nut cheese, things get complicated. Foods such as kelp noodles, nut cheese, nut milk, raw vegan pizza, and so forth, can be consumed two to five times a week without detriment to vitality. In the case of pizza, the crust is generally dehydrated fully and consisting of buckwheat, seeds or nuts. The crust is very dense, however the toppings may be very light and fresh. If all of the toppings are fresh vegetables (kale, sprouts) or sub-acidic fruits (peppers, tomatoes), then eating as much as two cups worth of the pizza in a sitting is fine. Kelp noodles are made from kelp, and are raw, but they are a food that is altered from how it exists in nature. From my understanding of them, it seems reasonable to consume one cup of them five times a week or less. I consumed them frequently in the Autumn of 2011 and didn't sense an issue. Fruits, like vegetables, can be eaten to your heart's content. As long as they are fresh (not dried or cooked), they are never fattening, and never anything but nourishing. Fatty fruits should not be included in your diet if you have a digestive condition (such as ulcers) that you're working to heal. Fatty fruits include avocados, durians, olives and coconuts. There is nothing wrong with the sugars found in natural fruit. The sugar is balanced by fiber, water, minerals and vitamins. It's wholly different than refined sugars. If you're a diabetic, you may need to work up to how much fruit you can eat. All refined sugar and animal products must be removed from a diabetic's diet before they can start eating fruit. For more information on that topic, watch Reversing Diabetes in 30 Days. Consuming 40% of your calories from raw vegetables in a day can be tough. However, if you drink a glass of carrot juice, eat a large salad with lettuce, spinach, kale, bok choy, cucumbers, onions, garlic, and leeks, make a nori wrap for a snack, and munch on celery while you're working, it can most certainly be done. It's not hard to do if you're doing a juice feast. You could snack your way up to 800 calories of vegetables. In the morning, wash 800 calories worth of vegetables and then keep them with you all day long. Snack on them at your desk, while reading, while watching TV, while being lectured by a spouse, parent or child, while cleaning, while listening to music, while checking your e-mail, while going for a walk, and so on. If you dislike vegetables, try hiding them in foods you like. You can add some kale to a smoothie in a small enough amount that you don't notice it. You can add lots of spices to your salads, like chili powder, to disguise flavors you dislike. Leafy, cruciferous, sea vegetable, herbs, flowers, bulbs, root vegetables and sprouts. I recommend getting most of your vegetable calories from leafy, cruciferous and sprouting greens. Then use herbs, flowers, sea vegetables, sauerkraut, bulbs and root vegetables to add various flavors and nutrients. Because sea vegetables are dehydrated, I don't recommend ever trying to fill your vegetable quota with a significant amount of sea vegetables. It will not only break your wallet, but leave you dehydrated. Does this sound too complicated to figure out on a daily basis? If so, then check out my week-long meal plans. Did you find value in this article? If so, please support and/or share my work. Support can be as small as a dollar a month subscription here – and all patrons get access to exclusive content of mine, including downloadable coloring pages, nutrition charts, my excerpts from my personal journal.